On Sunday, March 20th, newly formed Heart of the Bear Grove held their very first public ritual at Aquarius in Kansas City, MO. Before I start in on their beautiful traditional ritual, I'd like to take a moment to dote on how amazing Aquarius's new community room is! 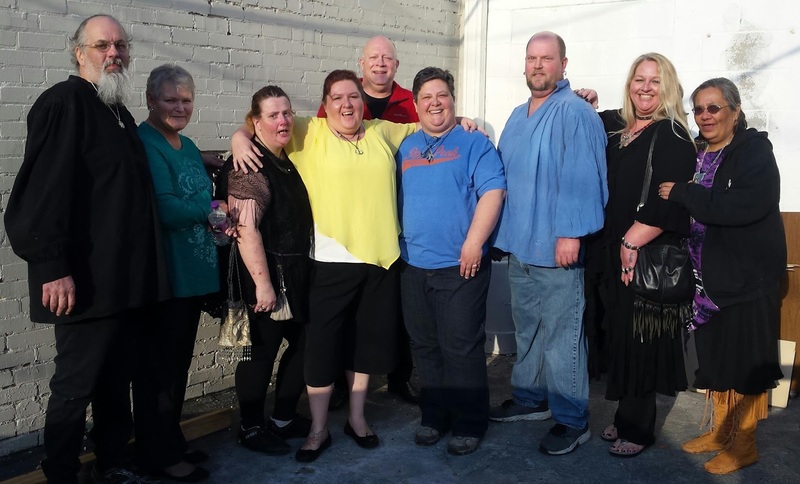 On December 1st, Aquarius had an electrical fire that led to the total devastation of their upstairs community room. But look what rose from the ashes! Those gorgeous wood floors really open up the space and give it a whole new feel. What an amazing space, perfect for a new group to welcome in a new season! I believe I spoke at one point about taking an Advanced Witchcraft class from Angela a few months ago. That class turned into the blossoming beginnings of a new group! 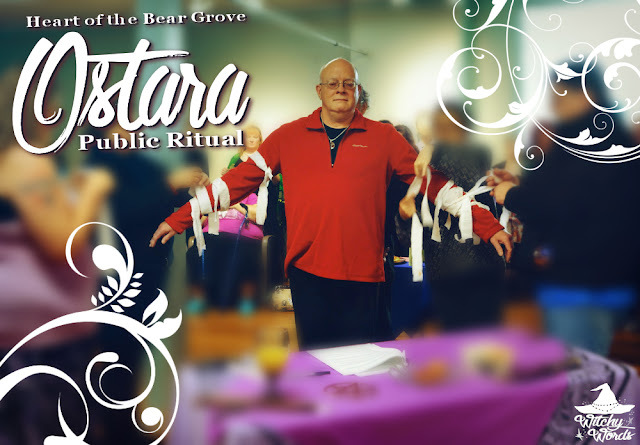 Heart of the Bear Grove, much like my own group, Circle of Fountains, does not identify as Wiccan and thus brings a new flavor of ritual to our community. 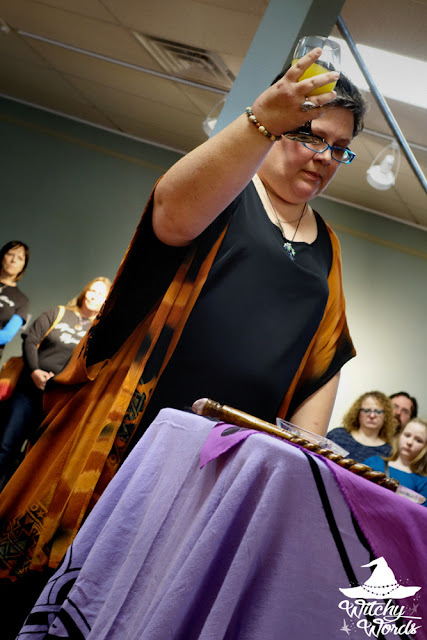 Mama Bear, as Angela is often called, opened up the ritual with a short introduction of both the group and the holiday, followed by the cleansing of the space. She began by combining the traditionally feminine elements of earth, seen in salt, and water. This was then passed about the members of the grove calling the quarters so they could cleanse the outer edge of the circle. The more traditionally masculine elements of air and fire, represented by a fan and a fire oil spray, were then combined with a simple spray and swish. These were also passed around the circle to cleanse the edges. The elements were then welcomed into the circle. Notice that no fire was used during this ritual. Mama Bear didn't want to tempt fate a second time after the tragic ending of last year. This is a fantastic example of a way to call elements if you cannot have candles in your space! Angela then spoke a bit about the Holly King, the adversary to the Oak King who rules the dark and cold portion of the year. The Holly King and Oak King are seen as dual aspects of a masculine deity. Mama Bear then turned to her counterpart and called upon the Holly King to come into the vessel of this man. 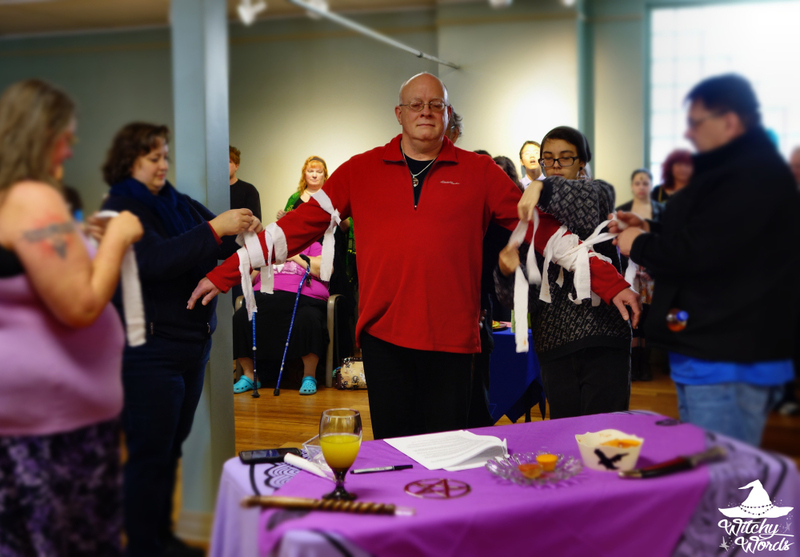 Before ritual had started, all attendants were given strips of cloth. 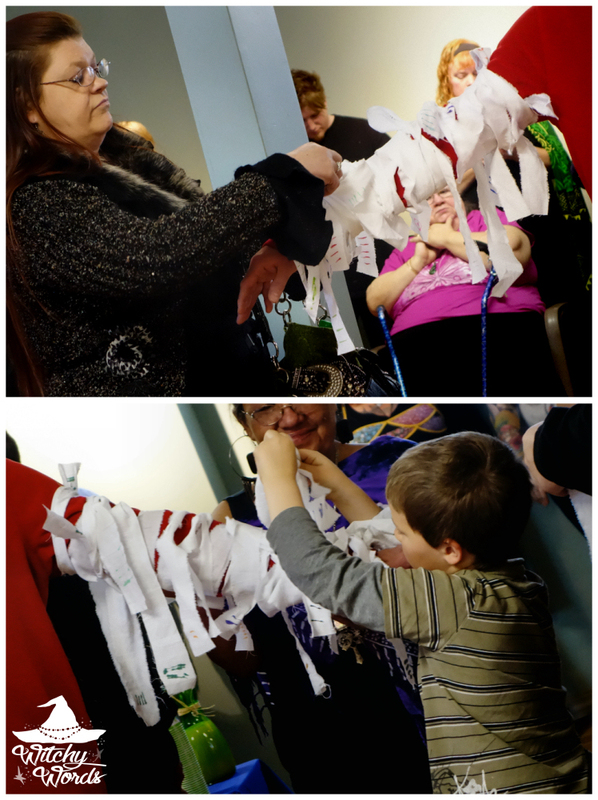 During this part of the ritual, we were asked to take markers and mark each end of the cloth. On one side, we were to think of all the wonderful events that occurred and things that were brought into our lives during the winter. For each item, we were asked to place a mark on the cloth. On the other end of the strip, we were asked to think about all the things winter took away from us. One by one, we came up and tied these strips to the arms of the Holly King, burdening him with our winter experiences. Once everyone had added their strips to the Holly King's arms, he was led out of the circle, symbolic of the passing of winter and the coming of spring. And in was brought another member of the grove, representative of the Sun God. During this portion of the ritual, the chalice was blessed as the womb of the woman, filled with fruit juice representing fertility. The athame was then blessed as the fertile part of man, and the two were joined as the origin story for all we see around us and the beckoning of the fertility of the land during spring! The juice and cakes, appropriately citrus to represent the sun, was then blessed. These items were passed about the room so that everyone may partake, with blessings including "May you never hunger," and "May you never thirst." With that, a few community announcements were made and the circle was released! Of course, festivities don't end after the ritual is over. 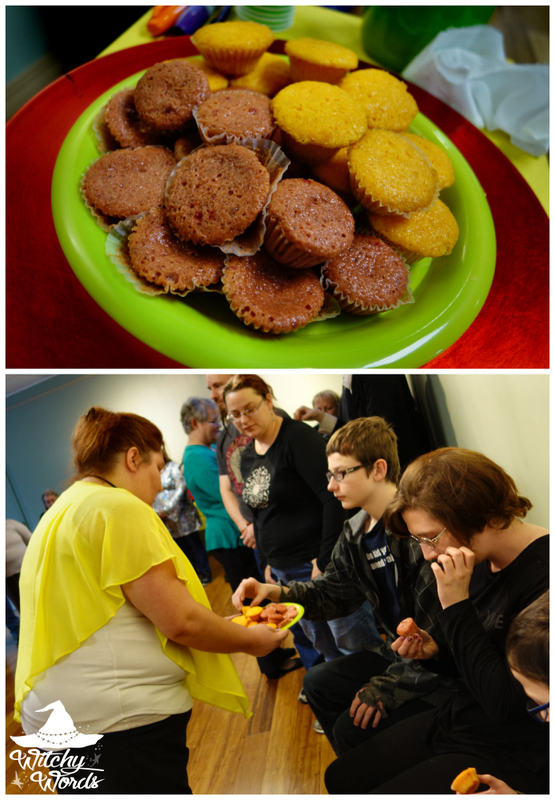 A potluck feast provided by the community and a raffle to compensate for the space, along with chatter from family and friends, completes the sabbat celebration. Thank you so much to Heart of the Bear Grove for providing a different perspective on celebrating Ostara! Congratulations to your newly formed group; may you all be blessed with love, happiness, togetherness and strength! And to my readers, I hope you had a fantastic Ostara! Thank you so much for your kind words Marietta! Of course, Angela! Thank you and your grove for the wonderful rit! I love that Liam made it into your pics! Aw, thank you so much! I truly appreciate it!